Varathan begins with Abin a.k.a Aby ( Fahadh Faasil) losing his high profile job in Dubai while the same his Priya ( Aiswarya lekshmi) encounters a miscarriage. Priya insists Aby to move to move out of Dubai for some time to Priy’s ancestral village where she grew up. Aby agrees to the idea and has got plans to start a startup business and thus heads back to Kerala. 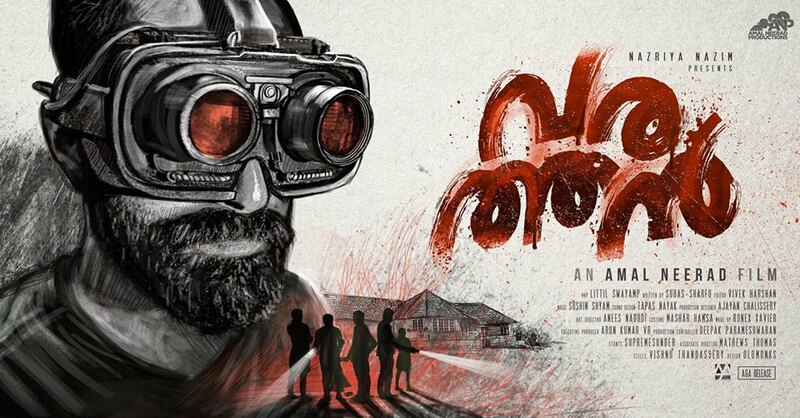 Varathan now unravels in a village, but not the Sathyan Anthikad sort of village full of ‘nanma’. Aby is a chilled out calm and composed person while Priya a brilliant student was the centre of attraction during her school days in the village before she moved out to Dubai. The movie then slowly moves on showing how an outsider(varathan in Malayalam) is being treated by the locals of the village and how the ex-classmates and notorious classmates of Priya tries to woo her and create a minor accident when Aby is away from the village for his business. The Villain trio of Sharfudeen (Premam Fame ), Vijilesh (Maheshinte Prathikaram fame) and Arjun Asokan sexually assault Priya. Amal Neerad then shows Abin’s pain at not being able to “protect” her (after she tells him that this would never have happened if her father were alive) is where the movie elevates followed by some racy mass elements and ending on a high note. Amal Neerad was as usual at his best supported by excellent cinematographjy from the Parava Fame Cameraman Little Swayamb. The BGMs and Songs were soothing and apt for the situation. Fahadh was as usually terrific while Aiswarya Lekshmi excelled in portraying the bold character of Priya. Sharfudeen’s performance was a shocker as viewrs had never expected him to perform a negative character with such perfection. Vijilesh and Arjun Asokan were good. Tail end : A classy uber stylish Amal Neerad Cinema !! A classy uber stylish Amal Neerad Cinema ! !